As group season continues, more Gap Year adventurers’ camp at Gaya Island! Home/Camps International, News/As group season continues, more Gap Year adventurers’ camp at Gaya Island! Adventure can be found at Gaya Island for our 8th group of UK-based Gap Year adventurers’ from Camps International, and they’re so lucky that we have a variety of fun island activities to offer them! So what are their exciting options? Everyone is invited to qualify as a PADI Open Water Diver, and for anyone already certified they can continue their dive education by completing the PADI Advanced Open Water Diver course or enjoy guided leisure diving in Tunku Abdul Rahman Park. 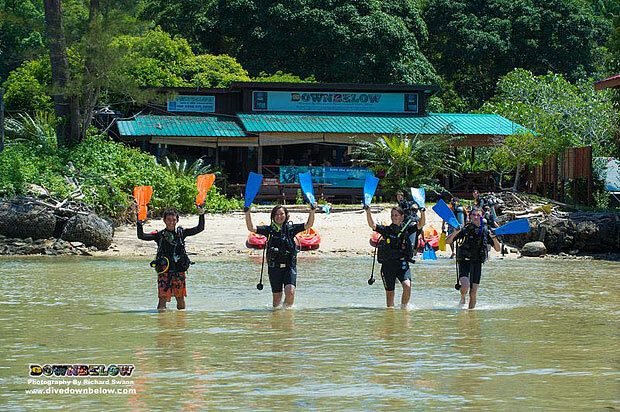 Non-diving activities are also offered, such as snorkeling, kayaking and jungle trekking. All island activities will teach the Gap Year students more about our natural environment and the importance of preserving its biodiversity, which is our dedicated mission as PADI professionals. One of our experienced PADI Instructors delivers the PADI AWARE Coral Reef Conservation Specialty presentation to engage our adventurers’ in a lively and open discussion to inspire positive action to protect the environment. Get in touch with our Head Office to outline a suitable itinerary with one of our members of staff and learn more about Borneo’s nature and have an adventure too! By Joanne Swann|2014-08-11T09:54:16+08:00August 15th, 2014|Camps International, News|Comments Off on As group season continues, more Gap Year adventurers’ camp at Gaya Island!